03:34 — Hellboy: New film accussed of whitewashing. 05:43 — Dirk Gently: Second season airdate. 07:15 — Doctor Who: New companion rumour. 09:13 — Xena: Reboot efforts canned. 10:35 — Indiana Jones: Fifth film to not feature the Mutt. 11:17 — Syphy: Killjoys renewed, Dark Matter cancelled. 12:04 — Locke and Key: Bode Locke cast. 12:43 — Stranger Things: Season 3 confirmed, 4 likely. 36:33 – Flotsam and Jetsam. 48:45 – Emails and listener feedback. 51:31 – Farewell for this podcast! 52:41 — End theme, disclaimer, copyright, etc. Wikipedia: Dirk Gently’s Holistic Detective Agency (TV series). 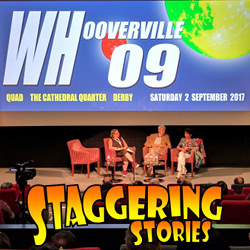 This entry was posted on Sunday, September 10th, 2017 at 10:00 and is filed under Doctor Who, podcast, review, Sci-Fi, staggering stories, Staggering Stories Podcast, Staggering Stories Regular Podcast, tv. You can follow any responses to this entry through the RSS 2.0 feed. You can leave a response, or trackback from your own site.